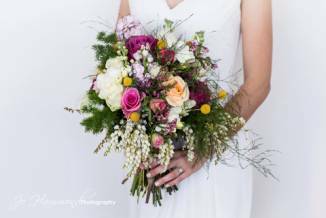 There is so much talent for wedding flowers and bridal bouquets in the Montville Maleny area of the Sunshine Coast Hinterland. All of these talented florists and floral designers offer a distinctive style and colour palette in wedding bouquets and buttonholes for the grooms. The tradition of the bridal bouquet stretches back many years. Not just for weddings – giving flowers for numerous occasions had a universe of special meanings in the Victorian Era. From native wedding bouquets to traditional classic bridal flowers, enjoy the gorgeous diversity of colour below.